Blackbird Presents, CMT, and Sony Legacy are proud to announce the broadcast premiere and audio/video release of Outlaw: Celebrating The Music Of Waylon Jennings. A collection of music’s legendary Outlaws and rising superstars came together for a once-in-a-lifetime concert event taping in Austin, Texas at ACL Live at The Moody Theater to celebrate the songs of music legend Waylon Jennings. On Friday, April 7, 2017, the two-hour broadcast premiere will air on CMT at 10 pm ET/PT, and Sony Legacy will release the concert film as a CD/DVD combo / digital download which is available for immediate preorder at Amazon.com and http://waylonoutlaw.com. Outlaw: Celebrating The Music Of Waylon Jennings features captivating performances, in-depth interviews, and compelling behind-the-scenes footage with Willie Nelson, Eric Church, Chris Stapleton, Sturgill Simpson, Kris Kristofferson, Toby Keith, Alison Krauss, Kacey Musgraves, Ryan Bingham, Jamey Johnson, Lee Ann Womack, Shooter Jennings, Buddy Miller, Jessi Colter, Robert Earl Keen, and Bobby Bare. The project was created by Keith Wortman and Mark Rothbaum, along with legendary Outlaws and musicians Jessi Colter and Shooter Jennings. Colter and Jennings also delivered their own heart-melting performances that evening in honor of Waylon’s music. Keith Wortman, Mark Rothbaum, Freddy Fletcher, and Jessi Colter are the executive producers. GRAMMY® Award-winning producer/musician Don Was and GRAMMY® Award-winning producer/songwriter Buddy Cannon served as co-music directors on the project. Was (bass) also led the all-star house band backing the performers, which featured Buddy Miller (guitar), Patrick Buchanan (guitar), Robby Turner (pedal steel), Raymond Weber (drums), Richie Albright (drums), Matthew Rollings (B-3, keyboards, & accordion), Mickey Raphael (harmonica), and Kari Kimmel, Carmel Echols and Sara Mann (backing vocals). If any one performer personified the Outlaw movement, it was Waylon Jennings. 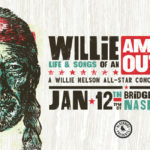 Over his sixty-plus albums, and with his imposing baritone and stripped-down musical style, he changed the world of country music and became a superstar. A Country Music Hall Of Fame inductee and GRAMMY award-winning artist—including Best Country Vocal Performance By A Duo Or Group with Willie Nelson—Waylon Jennings is an unmistakable country legend.